One mistake. That's is all it took for Tara and David's life to go haywire. One mistake that quickly turned their life into a living hell. Now, they have to figure out how to get out of the mess. 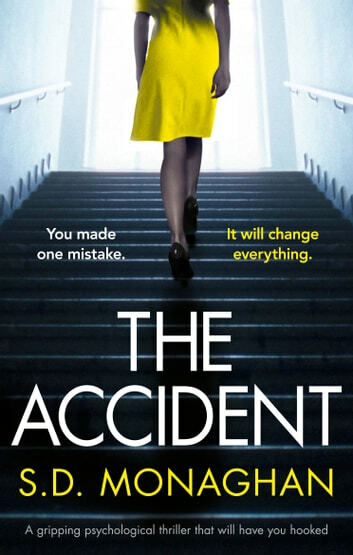 The Accident is a fast-paced thriller that thrilled me from the beginning until the end. Tara's mistake of having one last fling with her ex quickly unravel her and David's life. At first was I unsure about how I felt about David and Tara, but as the story progressed and through flashbacks did we get to know them, how they met, etc. did I start to feel that I liked them more and more and wanted them somehow getting out of the mess. And, what a mess, this is like one of those movies when everything keeps getting worse, every decision just pulls David or Tara deeper into a web of duplicity and danger. I loved it! I loved the twist and turns and I loved that you never knew for sure what was going on. The Accident is a fabulous book. I came to really like David and Tara, how they each had to figure out a way out of the mess that Tara's fling and David punch created. I love the whole chain reaction story, and there were several times during the books progressed when I thought "what now? What can go wrong now?" The Accident is a great thriller (Although the cat scene towards the end of the book could I have lived without) and I recommend it warmly! The Accident by S.D. 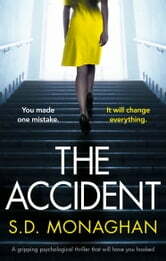 Monaghan Publisher: Bookouture Thanks to NetGalley and publisher Bookouture for ebook ARC of The Accident by S.D. Monaghan. Tara has it all. She is married to David and about to move into their dream house. Tara can’t explain why she is tempted by one last fling with her ex before she settles down. David would do anything for Tara. When he finds her with another man, his life begins to crumble all around him. Ryan isn’t ready for the punch that David throws at him. He stumbles and slips over the balcony and falls three storeys to the patio below. In one split second, a man will be killed. David and Tara’s life will change forever. How far would you go to save everything you have? I give this book a rating of 1 star. I did not finish. The book just wasn’t for me. I did not like the style of the writing. It sounded very good in the description, and I really wanted to read by the cover. The Accident 'Don't Put me Down' finish book. Book was a thriller from beginning to end with the twists and turns right up to the last page. 3.5 Stars David leaves work early, decides to take a last look at his brand new home before moving in tomorrow. Much to his surprise, his wife, Tara, is there .. and she's not alone. David is distraught at finding his newly pregnant wife with another man .. a man he knows very well. When Tara leaves, he confronts the man. During a scuffle, David pushes the man off the balcony and watches him fall three stories to his death. One shove, one push, one accident and life as he and his wife know it is changed forever. I wouldn't call this a 'gripping' psychological thriller. There are twists and turns, but it is more than a little predictable. It's still an entertaining read. The characters don't come across, to me, as credible. They're either too good to be true or bad in the way of movie bad guys. I was a little disappointed ... but I will surely take a look at whatever book comes next from this author. I would like to thank the author / Bookouture / Netgalley for the advanced digital copy. Opinions expressed here are unbiased and entirely my own.